by Peter L. Steinke. Rowman & Littlefield, 2006. What is most needed during times of congregational conflict is a way to disentangle from the fray and stand on the balcony for a better look at things. That’s what Peter Steinke provides in this e-book; a way to climb the stairs to the balcony and look deeply at the conflict and respond to it without anxiety and defensiveness. 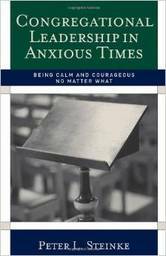 Congregational leaders from any faith tradition will find this small and simple volume a mighty help during anxious times. Steinke, an internationally known and respected expert in the field of family systems theory, especially as it relates to congregational life, breaks down the leader’s response to conflict into three aspects: the leader’s presence, the leader’s functioning and the leader’s challenges. Those who read this book will be calmed and equipped to navigate through all sorts of challenges with courage and hope. It will help leaders see those anxious times differently; as experiences that not only hold the potential for loss but also for creation, important learning, and changes that will ultimately strengthen the congregation.